I finished my St. Ives Apricot scrub and wanted to try something else. 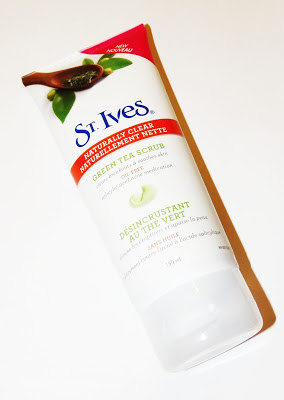 I picked up this St. Ives Green Tea scrub. ($3.77 CAD) It claims to clear breakouts & soothes skin. It has 1% of Salicylic acid which is an acne medication. I don't have acne anymore but I don't mind that it has the acid. It says that it helps treat acne pimples. Penetrates pore to control (reduce) acne pores. It's a light green color and it has a texture like lotions. It's not as gritty as the Apricot scrub, which I was surprised about but I love that it's not as gritty. This smells exactly like Green Tea. It's not a scent that lingers after you away and it's not unbearable either. A small amount goes a long way, as you can see in the pictures below. I like that you can feel it working as your rub this on your face. This works well on my nose which tends to be dry and flaky at times. After using this scrub my face feels very smooth. I put a moisturizing lotion on after using this. I love this scrub and definitely will be repurchasing it. My Esthetician told me that the Apricot Scrub is a little too harsh since it is very gritty. I feel like this one is much better for my skin. I haven't had an break outs using this product.